Shoes that have gotten wet or been in storage for a period of time may develop a musty odor. 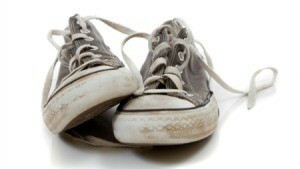 This is a guide about cleaning musty odors from shoes. HELP! I have just been given some faux fur lined suede boots by a friend. They are so lovely, but they have been in a cupboard that was a bit damp. It is not causing any problems to the actual boots, except they smell a bit musty. Has anyone any solution to how to make them smell a bit fresher please? Many thanks. Baking soda might get rid of the musty odor. Pour some baking soda into each boot then stuff the boots with newspaper. Leave in a dry place for a week. I've done this many times with musty shoes and purses -- it works! If you can get Febreze there by you, it works miracles on musty smells and so much more. What I did with mine was to pull the liner inside out and wash it with bleach and detergent, then let dry well, and before you wear them again, put in some new felt soles. That way you can wash those often more easily. Thank you so much everyone - I am trying the baking powder solution then I think I will get the Febreeze as well. I am so grateful to you for posting, I never thought of any of these solutions. Is musty the same as mildew? I know that mildew odors can be dissipated by using vinegar. If the boots are clean, then just set a sponge soaked in vinegar, and wrung out, under the boots and put the sponge and boots in a plastic bag and tightly close for a few days. How do I remove a smell from leather trainers? I have washed them, but it has made no difference. They smell mouldy and just down right stinky. Try putting orange peels and newspapers inside them for a while. I have shoes and a bag that were in a box in my cellar. It was in a cedar box (I thought). How do I get rid of the odor from the cellar? I am hoping there aren't any bugs. Thank you. We air out our camping items (which tend to get musty if it was raining when packed away last) in sunlight. I would start with putting them outside in the sun on a sunny day up off the ground. Fill them with scrunched up newspaper and let them sit that way for a day or two. The carbon from the newspaper print usually gets rid of all odors and moisture too! My sneakers got rain soaked and now have a musty smell. It is still there even after washing and drying. How can I get rid of the smell?